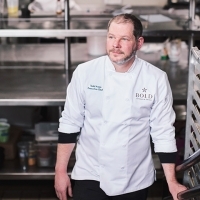 Boasting nearly two decades culinary industry experience, Todd Annis serves as executive chef at Bold Catering & Design, Atlanta’s most innovative catering and design company. As executive chef, Annis is responsible for both day-to-day and long-term initiatives including personnel management and menu development. Prior to joining the Fifth Group team, Annis spent eight years with Dolce Vita Restaurant Group as executive chef of Araxi in Roswell, Ga., and then at Rainwater in Alpharetta, Ga. He also taught a hands-on class in regional American cuisine at his alma mater, the Art Institute of Atlanta. Before becoming a culinary instructor, Annis honed his skills as executive chef of Atlanta’s Carbo’s Café. An active member of the Atlanta culinary community, Annis has participated in the Les Dames d’Escoffier International Atlanta Chapter’s Afternoon in the Country since its inception in 2000, Share Our Strength’s Taste of the Nation, a black-tie gala raising funds to help end childhood hunger, since 2001, and Taste of the NFL from 2009 to 2013. Annis was inducted into the Art Institute of Atlanta International School of Culinary Arts Hall of Fame in 2013 and awarded the American Culinary Federation’s International Award of Excellence in June 1996. When he’s not helming the Bold kitchen, Annis enjoys watching football, camping, working out and chasing his dogs around the neighborhood.